Astronics Corporation (Nasdaq: ATRO) has announced that the firm's wholly owned subsidiary, Astronics AeroSat, is introducing their next generation FliteStream™T-310 SATCOM connectivity solution for business aircraft. 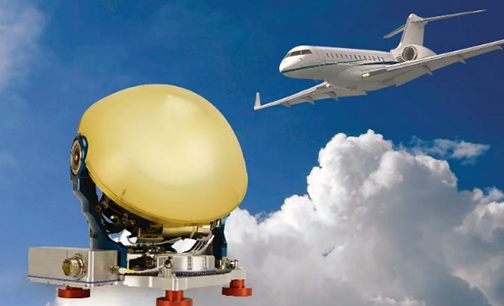 Astronics AeroSat is introducing its next generation of tail-mounted SATCOM antenna systems for use on business aircraft. Image is courtesy of the company. The FliteStream T-310 SATCOM connectivity solution includes the next generation iDirect CX780 modem, providing compatibility with Ku-band wide beam and high throughput spot beam satellite (HTS) networks. The FliteStream T-Series provides high-speed internet and IPTV in a single antenna. Astronics AeroSat will showcase the SATCOM connectivity solutions at the National Business Aviation Association Convention & Exhibition (NBAA) in Orlando, Florida, from October 16 through November 18, 2018, at booth #214. Matthew Harrah, President of Astronics AeroSat, said the company has developed this tail-and fuselage-mounted antenna system to provide maximum performance across the full range of Ku-band satellite technologies. By leveraging a flexible architecture that uses modem selection to define the network and link performance criteria, the company provides the inflight connectivity market with a scalable solution to meet any airborne SATCOM needs. The company continues with, and expands, the firm's direct relationships with Satcom Direct and Intelsat. Their respective selection and approval of these products for integration on their networks is validation of the firm's technology and approach to the market.